"A pirate’s life isn’t all 'yo-ho-ho and a bottle of grog,' ya know. It’s hard work escapin' from sea monsters and fallin’ overboard just in time to meet the local octopus. But it’s worth it when I find that map and start searchin' for treasure . . . except there's this pest of a princess who keeps gettin' to the clues before I do." "Life in the palace is so boring, all tuffets and tea parties! So when I find a treasure map and sneak away from the palace, I'm ready for some adventure. Unfortunately, there's a preposterous pirate in my way, and he's trying to steal MY treasure! I've got to get rid of him – and I think I know how!" A pirate and a princess are each searching for hidden treasure. The princess stays one step ahead of the pirate with every clue. But how can she get him out of the way long enough to dive for the treasure? "You're not a real pirate!" she claims. "Am so." "Are not." "Am so." "Okay, prove it!" "How?" "You know, I had to prove I was a real princess once," she says. "I'm sure we can use the same method . . ." and she leaves him snoring on a tall pile of mattresses. But when the princess is in danger from a giant octopus, she quickly discovers the benefits of cooperation! Inspired by their success, the pirate and his new princess friend sail off together in search of further adventure. 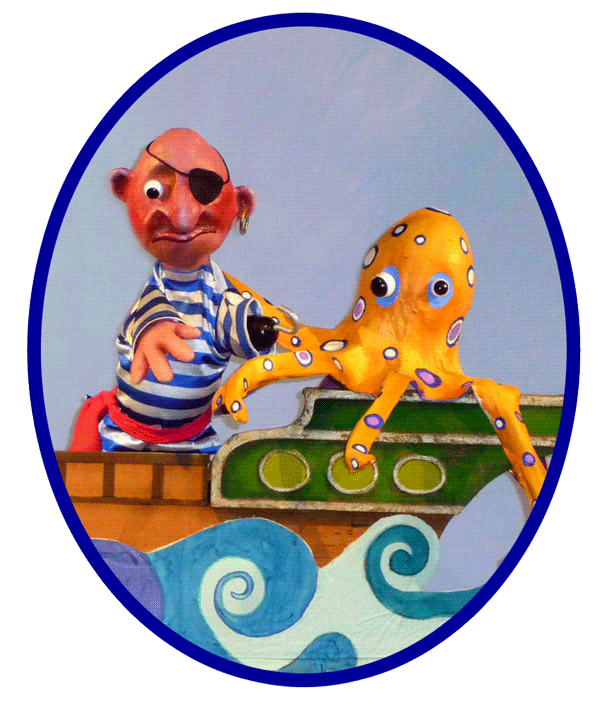 Join Crabgrass Puppet Theatre on a thrilling voyage chock full of sea monsters, sharks and side-splitting action! "Thanks again for another wonderful performance! The students and staff enjoyed it so much! You continue to amaze!" 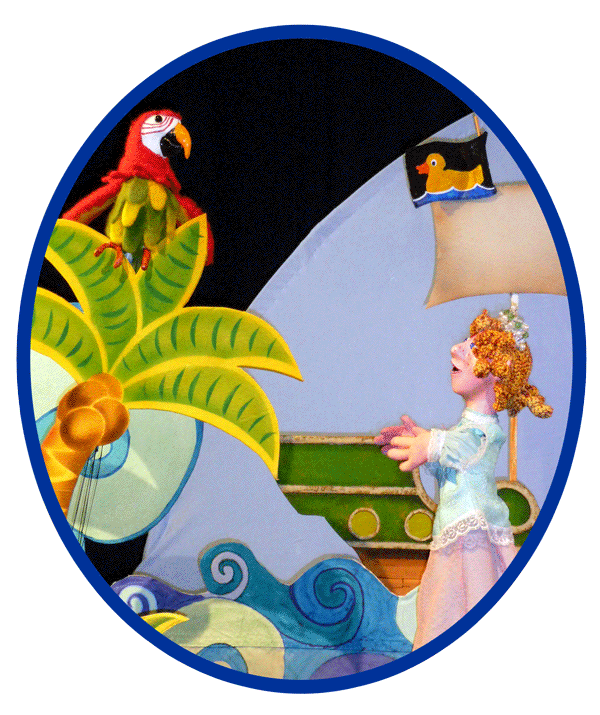 All text and images copyright 2004 - 2014 by the Crabgrass Puppet Theatre, Jamie Keithline and Bonny Hall.